Next-generation HiLux models for Australia will feature an interior that is tough and functional for the daily grind as well as offering advanced features demanded by workers, recreational users and their families. The SUV-like cabin will provide a more comfortable driving position even for people with larger builds thanks to increased front head and shoulder room, an expanded range for seat-height adjustment, and tilt-and-telescopic steering. Dominating the dashboard is a modern tablet-style touchscreen within easy reach of the driver and front passenger, while buttons on the steering wheel allow easy operation of the audio system and a connected smartphone, including voice recognition. Other new interior appointments across the range include air-conditioning, cruise control, headlamp levelling, 12-volt accessory socket, intermittent wipers, a centre console box and power operation for the windows, mirrors and door locks. The next-generation HiLux range, which goes on sale from early October, will encompass 31 variants with a choice of two new turbo-diesel engines, two petrol engines, three transmissions, 4×2 and 4×4 drive, three body styles and three equipment levels. Comprehensive safety features include a reverse camera on all pick-ups and an accessory camera available for cab-chassis buyers as well as seven airbags, stability and traction control, anti-skid brakes and an emergency stop signal. Seat-belt reminders are now fitted standard to front seats in all variants and for rear seats on double cabs. Toyota Australia’s executive director sales and marketing Tony Cramb said next-generation HiLux heralds the era of refined trucks that are engineered to suit varied demands from many types of customers. 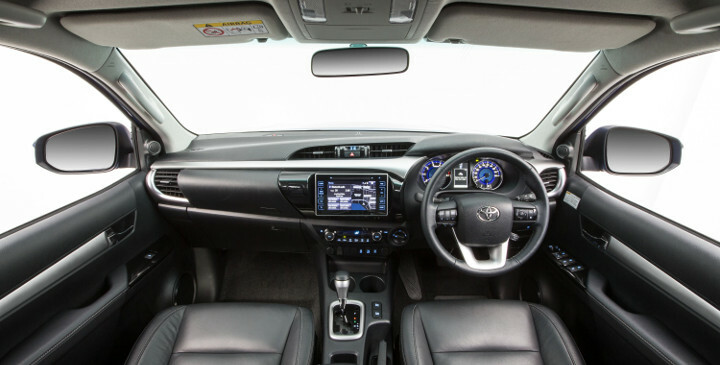 “Even workers in tough industries like mining, building and farming want the space, ergonomics, technology and ride comfort of the new HiLux interiors – and so do their families,” he said. Seats in tough WorkMate variants are now covered in hard-wearing black fabric instead of vinyl while the floor covering remains vinyl to meet the durability customers require. SR and SR5 grades have carpet on the floor and high-grade seat material while SR5 turbo-diesel 4×4 double cab buyers can specify power-operated front seats with leather-accented trim. These variants gain an air-conditioned box capable of heating or cooling two 600ml bottles for the convenience of workers and families. Every HiLux 4×4 is fitted with an electronic transfer-case dial while SR and SR5 versions are equipped with a rear differential lock for added off-road traction. All extra and double cabs have increased rear-knee clearance while the rear seat in double cab SR and SR5 variants is now split 60/40 with a stowable armrest, providing flexible seating and storage options. WorkMate supplements its rugged character with welcome features including a 6.1-inch touchscreen display for viewing the reverse-camera image (pick-ups) and controlling the audio system, which includes AM/FM radio, CD player, auxiliary/USB input+, Bluetooth®* and two speakers. Mid-range SR offers two speakers in single cabs, four in extra cabs and six in double cabs. SR5 extra cab is equipped with four speakers. Double cab SR5 variants are fitted with six speakers, a seven-inch touchscreen and Toyota Link connected mobility#, which can provide access to Pandora®## internet radio and help find fuel, a destination, weather and other assistance. SR5 also has digital audio (DAB)^^ and satellite navigation^, giving drivers the option of being guided to destinations found through the Toyota Link# system. For a small fee, SR5 drivers can use Destination Assist** to request the help of an operator to find a particular destination. The destination and contact details are sent to the vehicle using the Destination Download app**. A multi-information display on the SR instrument panel is upgraded to a 4.2-inch full colour display on SR5 variants, which also gain a 220V connector – suitable for plugging in a camping refrigerator – as well as a second 12V socket. To accommodate families, all HiLux double cabs feature two top tether anchors and ISOFIX attachment points for the rear seat. SR5 is also distinguished by keyless smart entry and start, automatic air-conditioning, chrome door handles, premium steering wheel and shift knob, upgraded instrument cluster with cool blue illumination, an alarm, auto headlamp levelling and silver highlights throughout the interior. + Not all devices will be compatible. Functionality varies depending on device. #Toyota Link is available on certain vehicle models and grades only. Toyota Link services rely on data from the driver’s compatible mobile phone and information provided by third parties. Availability is dependent on a number of factors, including the availability of third party information, mobile service, sufficient mobile data allowance and GPS satellite signal reception. Mobile usage is at the user’s cost. Toyota Australia reserves the right to add, remove or modify applications. Further information is provided at http://www.toyota.com.au/toyotalink. ## Pandora, the Pandora® logo, P, Music Genome Project, Comedy Genome Project, and the “Lights” design are the registered trademarks or trademarks of Pandora® Media, Inc. and its subsidiaries. **Destination Assist is provided for a fee of $2.97 (including GST) per use charged by Toyota Australia. User credit card details are required for use. Terms and conditions apply. Destination Assist is available in certain vehicle models and grades only. Further information is provided at http://www.toyota.com.au/toyotalink. Destination Download and Local Search operate from information provided by Google Places, which may not be accurate or cover all areas. Navigation is available in certain vehicle models and grades only. ++Reversing camera is a driver assist device only and should not be used as a substitute for safe driving practices. The area into which the vehicle is driven must be visually monitored by the driver.